The result of this revelation is SKYE | ROSS, an album that pursues its own musical path while returning to the roots of the sound that made Morcheeba a household name back in the late 1990s. 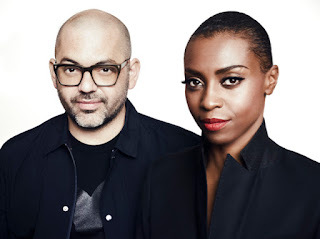 It is, Ross explains, “what Skye and I do naturally when you ask us to make music together, and yet not necessarily a continuation of what we’d been doing with Morcheeba. It therefore felt only right to give it a new identity.” The album will be released September 2nd on Cooking Vinyl. Coinciding with the new album, SKYE | ROSS will play a series of UK concerts starting 30th October in Birmingham, taking in Bristol, Brighton, London and finishing in Manchester on 4th November. Tickets go on sale Friday 22nd July. SKYE | ROSS will premiere new music from the album, as well as play fan favourites from Morcheeba. It’s not the first time either of them has stepped outside of the safety of their familiar, long-term musical environment having each released solo projects. For a while they toyed with the idea of making an ‘unplugged’ record, but soon realised it would be possible to write something more ambitious. Of course, Ross has long been an outspoken fan of leftfield acts from Dinosaur Jr. to Aphex Twin, and talks about how, in their early days, “we could bring in anything: minimal beats, country music, blues, whatever we wanted. It was a pretty blank canvas, and I feel like this record has gone back to that. Because if it feels right for the song…” And amongst the things that feel right for these songs are big guitar solos, with Ross at last embracing the opportunity to place his fluid skills higher in the mix, just as they are during Morcheeba’s celebrated live shows. Still, that’s hardly surprising given that the baby sitar-soaked ‘Feet First’ was inspired by reading Jimi Hendrix’s diaries from when he trained as a paratrooper.